Striker shows support for Show Racism the Red Card. 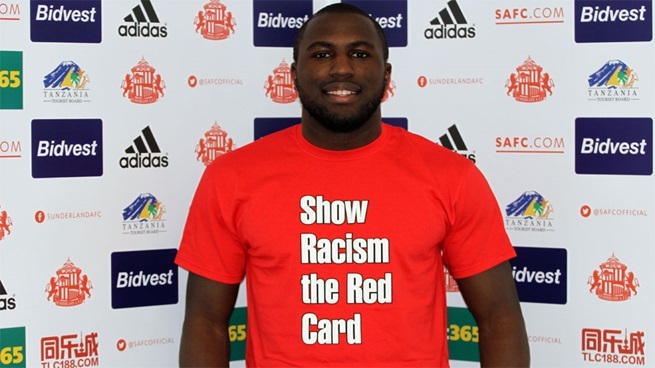 Striker Jozy Altidore has become the latest Sunderland AFC player to show his support for Show Racism the Red Card, becoming an ambassador for the educational charity. The USA international, who also sits on FIFA’s international anti-racism task force, becomes SAFC’s 2014 ambassador for the organisation, which works with over 50,000 people throughout the UK each year, educating young people on anti-racism and social inclusion. Speaking about his role, Jozy Altidore said: “I’m delighted to be lending my support to an incredibly important organisation like Show Racism the Red Card and to be promoting the vital work they do within our community. “I’ve experienced racial abuse first-hand and I know how it can affect people. It’s something that we need to stamp out of society and the proactive work that organisations such as Show Racism The Red Card undertake is vital in helping to promote a positive message of inclusion. Show Racism the Red Card, Chief Executive, Ged Grebby said: "It’s great to have Jozy Altidore as the latest ambassador for our campaign. The use of footballers as anti-racism role models is central to the work we do." "Sunderland football club have been outstanding supporters of our campaign since 1996, and we again thank them for their wonderful support this season."